On March 2, 2011, JR won the TED prize at the TED Conference in Long Beach, California, and called for the creation of a global participatory art project with the potential to change the world. This project is called Inside Out. 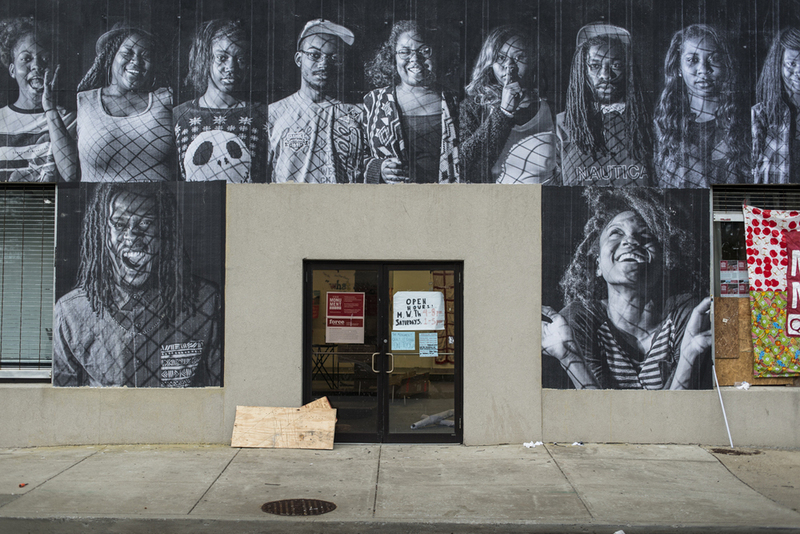 Inspired by JR’s large format street “pastings”, Inside Out gives everyone the opportunity to share their portrait and make a statement for what they stand for. It is a global platform for people to share their untold stories and transform messages of personal identity into works of public art. Each Inside Out group action around the world is documented, archived and exhibited online. Nearly 200,000 people from more than 112 countries & territories have participated. The Inside Out project has traveled from Ecuador to Nepal, from Mexico to Palestine, inspiring group actions on varied themes such as hope, diversity, gender-based violence, and climate change. 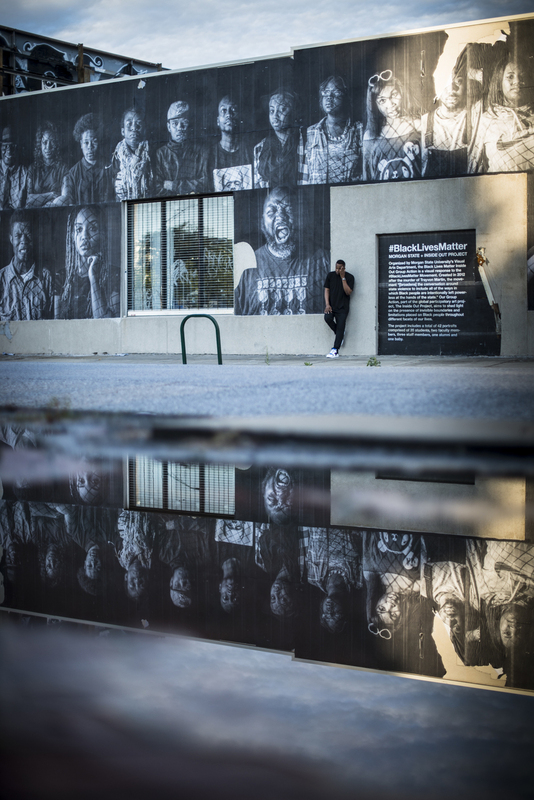 Project Mission: Organized by Morgan State University’s Visual Arts Department, the Black Lives Matter Inside Out Group Action is a visual response to the #BlackLivesMatter Movement. Created in 2012 after the murder of Trayvon Martin, the movement “[broadens] the conversation around state violence to include all of the ways in which Black people are intentionally left powerless at the hands of the state.” Our Group Action aims to shed light on the presence of invisible boundaries and limitations placed on Black people throughout different facets of our lives. Project Description: During the Spring 2015 semester, students enrolled in Chris Metzger’s Computer Graphics II and Computers in Art Design courses collaborated on an Inside Out Group Action. By participating in The People’s Art Project, we are joining hundreds of thousands of others from around the world in using art to stand up for a cause we feel passionate about. Throughout the collaborative process, all students were required to submit proposals outlining possible themes for our Group Action. Once themes were presented, a group of 12 students narrowed down the ideas, settling on the three strongest options. These options were then disseminated to the group through a survey and the Black Lives Matter theme was chosen by the majority. By collectively defining a group message we’ve had the opportunity to build community locally, while adding to the conversation globally. Once our message was clearly defined, students enrolled in Computer Graphics II took on the added responsibility of visualizing the message through black and white portraiture. After a week of experimentation, we settled on the casting of a fence shadow on the subjects to symbolize the presence of invisible boundaries and limitations placed on Black people throughout different facets of our lives. 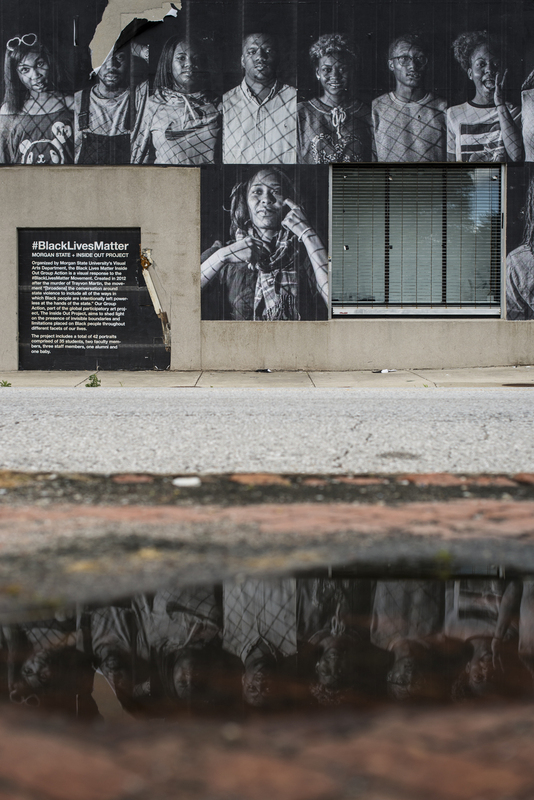 At the project’s conception we had no idea the events that would soon unfold in Baltimore following the death of Freddie Gray; however, our project seems even more relevant today than when we first began. Although saddened and disturbed by the continued use of deadly force by police, we are hopeful that our project adds to the growing awareness of police brutality and the value of Black life, locally and nationally. 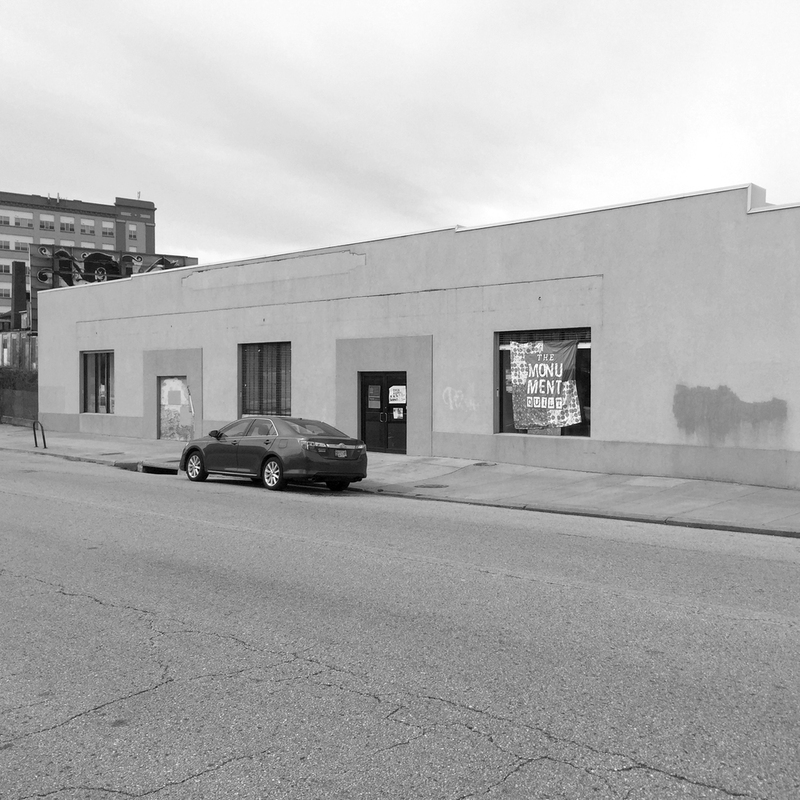 Location: The project is currently installed on the facade and north side of the future home of Open Works, a makerspace and incubator lab, located at 1400 Greenmount Avenue in Baltimore City. The project was made possible through the generous support of The Deutsch Foundation, Baltimore Arts Reality Corporation (BARCO), Maryland State Arts Council, Greater Baltimore Cultural Alliance (GBCA) and Morgan State University. Press: Thank you to all the media outlets who decided to share our project and our story! The Huffington Post, artnet news, Hyperallergic, Bmore Art, Baltimore Magazine,Widewalls, Morgan State News, The Baltimore Sun, NewsRadio 99.1 CBSDC and last, but certainly not least, The Inside Out Project.